In my parents’ Chinese restaurant, we used to make three soups every day without fail, and it was always the first thing we would do when we opened the restaurant. Wonton soup, hot and sour soup, and egg drop soup––the classic trio offered on every Chinese menu. Making these soups during the winter months would help warm up the kitchen as we started our day, and, oftentimes, I would have a small cup of wonton soup broth or egg drop soup to start the day. 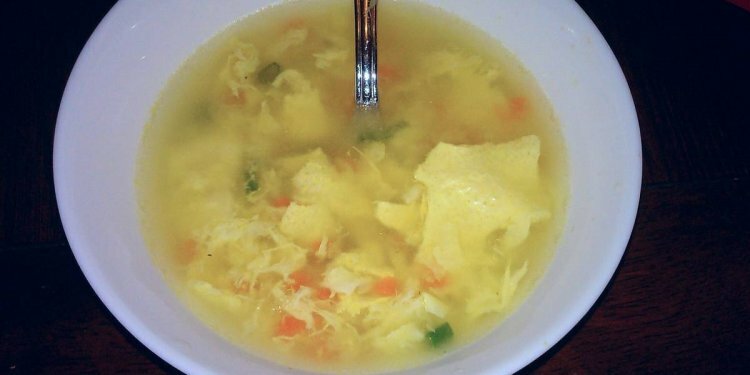 The name “Egg Drop” comes from how the soup is made—dropping raw egg into hot soup. It doesn’t take a genius to figure that out. But actually, the direct translation in Chinese is egg flower soup, because the egg creates large and small swirls in the soup in a flower-like pattern. Of the three classics, everyone has their favorite, and a nice cup of soup before your favorite Chinese lunch special is always a welcome starter. My personal favorite is classic wonton soup, but I do like a good egg drop soup when it’s done right! There are many variations of egg drop soup but this recipe is a classic restaurant-style egg drop soup that you can make at home. So the 300-pound gorilla in the room is why make it at home when you can buy a small order for a buck fifty? Three reasons: M, S, and G.
Yep, monosodium glutamate is used liberally to make these soups in most restaurants, although many restaurants these days do limit their use of MSG. If you want to be sure to skip out on the MSG in your soup, you’re safest bet is to make your own, and use homemade chicken broth, store-bought organic chicken broth, or even vegetable broth. You can season your egg drop soup to taste and maybe even use organic eggs. This restaurant-style egg drop soup recipe is so quick and easy to make that you probably could have made a bowl for yourself in the time it took me to write this post! (Although I have to admit, I am a very slow typist.) Hope you enjoy this one! Next add the cornstarch slurry; make sure the cornstarch and water is mixed well, as the cornstarch settles very quickly. Stir the soup continuously as you drizzle in the slurry, or you’ll get unpleasant clumps of cooked starch in your soup. Use more or less starch if you like a thicker or thinner soup. You can also add the starch in a couple small batches, let the soup simmer for a couple of minutes, then check to see if the consistency is to your liking. Now we’re ready for the most exciting part: the egg. This recipe calls for the egg to be slightly beaten, which results in both white and yellow egg swirls. The speed at which you stir the soup when adding the egg also determines whether you get large “egg flowers” or small egg flowers (i.e. swirly bits of egg). This is more a matter of personal preference than correctness. If you vary the speed at which you stir the soup, you’ll get both. Some people even prefer chunks of egg in their soup, so do whatever suits your preferences! Once the soup’s consistency is to your liking, use a ladle to stir the soup in a circular motion, and slowly drizzle in the egg until you have added it all. Ladle the soup in a bowl, top with scallion and cilantro, drizzle some sesame oil over the top, and serve! Once the soup's consistency is to your liking, use a ladle to stir the soup in a circular motion, and slowly drizzle in the egg until you have added it all. Ladle the soup in a bowl, top with scallion and cilantro, drizzle some sesame oil over the top, and serve!